Despite January coming to a close, trends are still top of mind for today's meeting and event planners and marketers. Everyone wants to know what they can expect to see in the coming year, as well as which of the many trends out there are worth investing in and what will make their events even more exciting and successful. To find this out, we reached out to ten industry experts and asked them to share their top trend that planners and marketers can expect to see in 2019. From unique venues and high tech event furniture, to personalization and artificial intelligence, here's what will be big in the year ahead! For 2019, the most significant trend I’ve been seeing has been related to cyber security. We hear stories all the time about hackers and all the crazy things they can do. However, people don’t realize how much the events industry is a target for these hackers. Registration platforms, for example, hold so much information, from credit card data to passport information. More planners will recognize the need to have an expert on their team who understands Wi-Fi and data security, just as much as their catering person, their A/V person, etc., and that it’s also important to be aware of it and more secure themselves. Digital marketing and ad platforms have been adding AI at a super-fast pace—and eventually, it’s possible that these campaigns will become the equivalent of self-driving cars. In a few years, I expect that half of the work currently done by human staff will be handled via AI tools. AI is already powering tools to write marketing text copy. Bots at the Associated Press and other media outlets generate short financial, technical and other stories from press releases and other sources. But in a crisis, human skill and action will still be paramount. AI will be used to get a lay of the land, but it can’t validate the brand’s argument from the point of view of a human observer. I don’t see AI being able to do this for quite a while. While the concepts and technologies behind interactive videos are not new, at the end of 2018 Netflix put their might behind it. With Black Mirror: Bandersnatch, Netflix subscribers had a first-hand, elegant "choose your own adventure" video experience. As with most things Netflix these days, when Netflix does something new, it can spark a trend. In this case, based on the early industry chatter and client interest we are seeing, interactive video will be the hot experience for brands to pilot in 2019. Event software and hardware products will become a critical part of the marketing stack. Using machine learning, event planners will be able to identify their most valuable attendee segments and activate audiences through digital channels to fill their events with the right attendees. Event planners will be able to provide attendees with a personalized experience so that their limited time at the event is as relevant and engaging as possible. All of this data will be integrated into a format that marketing and sales systems can digest to define multi-touch attribution and build targeted online lookalike audiences. Digital marketers and CMOs will start to rely on offline event data to guide their online marketing. The trend of choosing non-traditional and unexpected venues is still “in,” and popular in 2019 as well. Recent years have shown a trend towards hosting events in the malls, hangars, or public places, such as parks, libraries or piers of a harbor. Historical venues with their unique history and culture have recently become popular as never before. People are expecting more unusual event venues, such as abandoned factories, aerodromes or art galleries. Art galleries are based on people’s desire to learn and create: event planners will want to combine art entertainment at the art venue providing art activities. The top trend we will see continue is personalization, using the reams of data we have available to allow participants to create their own best experience within our events. A big part of your best, personal experience is planned serendipity, where we create spaces for intersections among like-minded people. These spaces will also be designed for comfort, allowing participants to select from being seated on a bench or couch, at a table high or low, or standing with space to place their belongings, and charge a device or two. The personalized experience also means never being hungry, as your unique dietary need is met, and ultimately, to feel you are part of an event where you are both impacted and can have a positive impact, often leaving a legacy behind, which leaves you transformed in a way you did not expect when you arrived. The pressure is on, but today’s event professional is more than up for it! While the social media place certainly is a "pay to play" environment, it’s still generally true that advertising budgets can reach considerably more users on social media channels than with other forms of digital advertising. Costs per click are considerably lower, and, when utilized correctly, audience targeting parameters can help even the most modest of budgets reach a ton of people. Additionally, because of the social nature, social media budgets are much more exponential in reach than other forms of online advertising. Remarketing is the biggest missed opportunity in the event space. It's the way retailers like Amazon and ASOS follow you around the web with display ads for that gadget or outfit you checked out but didn’t buy. And this marketing opportunity is open to anyone, even if you only have a very modest budget. If someone looks at a specific event speaker but doesn’t complete their registration to attend an event, planners should take every opportunity they can to persuade them to get out their credit card by showing them banner ads with the face and details of that speaker. Wireless charging is beginning to manifest in event furnishings, allowing attendees to drop their device for a seamless charge while they network and connect with other attendees. Many furniture options today have smooth, sleek designs that can be easily incorporated into any design aesthetic and event attendees will be able to enjoy and share every element of an event without worrying about their battery levels on their smartphones, tablets, laptops, and other devices. Content marketing is expanding beyond blogs, white papers, conferences, and VIP dinners into a regular part of employees’ daily routines with podcasts in nearly every topic. Sources of downloads proliferate via Apple, Android, SoundCloud, Spotify, Stitcher, and more. Now the tech will need to advance to better measure the ad effectiveness of these media, and users will continue to be confused by the abundant choices and will look to new sources to curate for them, maybe even pay for this type of service. 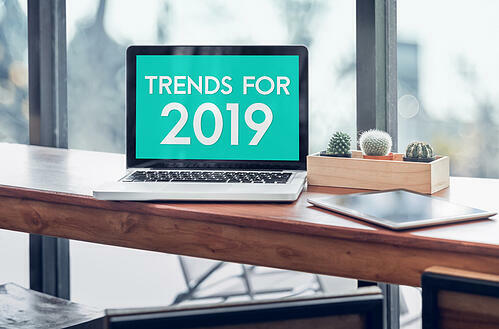 Which of these 2019 trends stands out the most? Did our experts miss anything? Share in the comments below!